Rwandan genocide 20th anniversary: How reconciled are Rwandans? Twenty years after the genocide, the country has made tremendous progress. But how much can survivors forgive murderers? 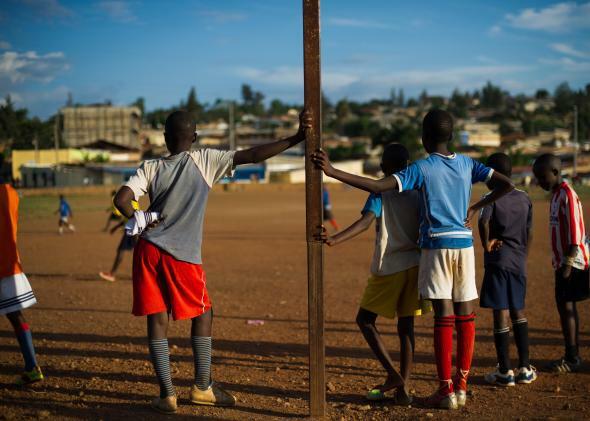 Rwandan children take a break during a youth soccer game in the Gikondo suburb of Kigali on March 16, 2014. KIGALI, Rwanda—In April, Jean Pierre never switches on his television, afraid of what might happen to his wife, Grace, if she sees the programs broadcast during Rwanda’s annual genocide commemoration week. A Tutsi living in Kigali, Grace was slashed with machetes and left for dead during the 100 days of slaughter that began on April 6, 1994, shortly after Hutu President Juvénal Habyarimana was killed when his plane was shot down over the Rwandan capital. The attack mobilized Hutu government soldiers and allied extremist militia, who orchestrated the genocide to exterminate the Tutsi minority. In villages across the densely populated country, neighbor turned on neighbor as victims were hacked to death, burned alive, clubbed, and shot. 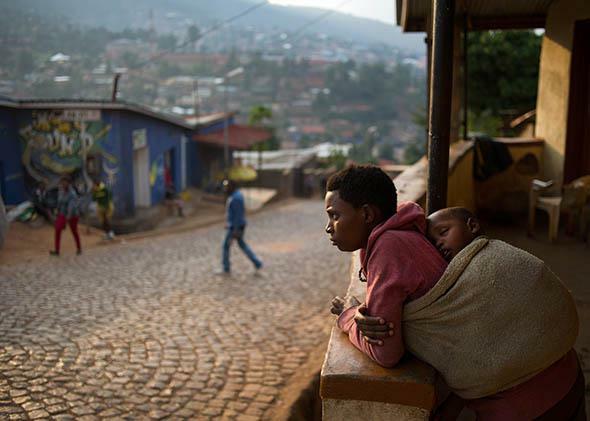 The fighting ended in July 1994 when the Rwandan Patriotic Front, a Tutsi-led rebel movement that swept in from Uganda, marched on Kigali and seized control of the country—but not before some 800,000 Tutsis and moderate Hutus had been killed. “When the commemoration week starts, many people get traumatized because the past comes straight back into their hearts,” said Jean Pierre, 44, who declined to give his real name. A flame of remembrance has been touring Rwanda’s green hills for the past three months, with both survivors and perpetrators presenting their testimonies at each stop. On April 7, President Paul Kagame will use it to light a national flame of mourning, which will burn for 100 days. But many say this show of collective mourning masks deep divisions in a country struggling to overcome lingering resentment and achieve true reconciliation and justice. The specter of the genocide, said to be the fastest of its scale in history, is omnipresent in Rwanda, a tiny, mountainous land lying in the heart of Africa. Signposts off the tarmac roads point to churches where massacres took place. Inside, skulls and bones are neatly arranged in lines. The clothes of the dead are piled on the pews. School books, rosary beads, and identity cards belonging to the dead are displayed alongside rusty machetes and pipes left behind by the killers. The guides are all survivors, often still visibly traumatized. He said this polarization was reinforced by the justice meted out in the wake of the genocide when village courts, known as gacaca, were established to clear a backlog of genocide cases that had overwhelmed Rwanda’s judicial system. Between 2001 and 2012, more than 2 million cases were tried in 12,000 community courts, where locals were encouraged to gather under trees and beneath aluminum roofing to discuss what happened. But no Tutsis were put on trial, either in gacaca or at the International Criminal Tribunal for Rwanda in neighboring Tanzania, which prosecuted the architects of the genocide. One of the government’s main reconciliation policies is to promote a Rwandan national identity by discouraging people from using ethnic labels, banning ethnic-based parties, and outlawing “divisionism,” a vague offense that includes behavior that stokes ethnic tensions. Critics say the government uses “ethnic amnesia” to hide Tutsi predominance in all levels of public life. “The RPF has to deny ethnicity because if they allowed ethnic identification, you could then establish formally that the Tutsi elite is hugely over-represented in institutions,” said Reyntjens. A woman stands on her porch in a suburb overlooking Kigali, Rwanda, on March 13, 2014. Three-quarters of Rwanda’s 250 to 400 most influential people are Tutsi, according to Reyntjens. At the local government level, at least five out of six are Tutsi in a country where 85 percent are Hutu, he said. In 2003, Kagame introduced a presidential decree, allowing many of those who confessed and requested a pardon to be released from the country’s overcrowded jails. Large numbers of convicted perpetrators now live alongside survivors. While some live in harmony, the prisoner amnesty also created resentment. During the era of gacaca, there was emphasis on getting perpetrators to confess and survivors to forgive, analysts said. Some regard this as little more than political theater. “I don’t think genocide survivors have forgiven perpetrators,” said Aggee Shyaka, a senior lecturer in the University of Rwanda’s Centre for Conflict Management, who was told by survivors during his research that they offered forgiveness because the government told them to. “It was not a deep, serious conviction. They did it because it was part of the [government] program,” he said. Similarly, many of those who confessed did so to win reduced sentences. Judging by history, peaceful coexistence is not enough. In the past, simmering tensions have been a prelude to violence in Rwanda. This feature is part of the Thomson Reuters Foundation’s special report on the 20th anniversary of the Rwanda genocide. For first-person witness accounts, fact sheets, and more, visit rwanda20.trust.org.